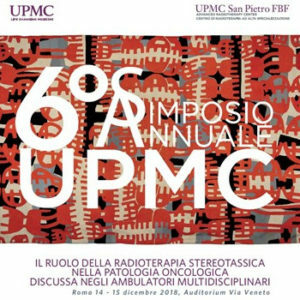 The 6th Annual Symposium of UPMC, entitled “The Role of Stereotactic Radiotherapy in Multidisciplinary Oncological Outpatient Clinics” will take place on December 14-15, 2018 in the premises of the Auditorium Via Veneto (Via Veneto 89, Rome). The event is free and accredited on Agenas for the provision of 10 CME credits. The goal of the 2018 UPMC Symposium is to compare the experiences of different Italian centers, highlighting common therapeutic strategies for treatment of the reviewed oncology diseases. Stereotactic Radiation Therapy (SRT) has modified the preexisting guidelines, times, and therapeutic associations. Thanks to its low toxicity and shorter time of treatment, SRT is included in the multidisciplinary therapeutic process, and associated with other surgical treatments and traditional (chemotherapy) and innovative (target therapy and immunotherapy) therapies. The Symposium aims to bring together the different professionals involved in the treatment of oncology patients. Radiation oncologists, oncologists, surgeons and medical physicists will discuss treatment hypotesis, the decision tree implemented in their respective oncology outpatients clinics to treat neoplastic lesions in four body disctricts (brain, thorax, abdomen, and pelvis). Thanks to UPMC’s international stature and vast clinical experience, this event will represent a great opportunity to disseminate scientific knowledge on important techniques used to treat oncology patients across Europe and worldwide. Surgeons: Gastroenterology, Geriatrics, Respiratory Diseases, Internal Medicine, Neurology, Oncology, Radiotherapy, General Surgery, Thoracic Surgery, Neurosurgery, Urology, Nuclear Medicine, Neuroradiology, Radiodiagnostics, and General Medicine (family doctors).